Hoverboards are real! Back to the Future 2 was right…sorta. 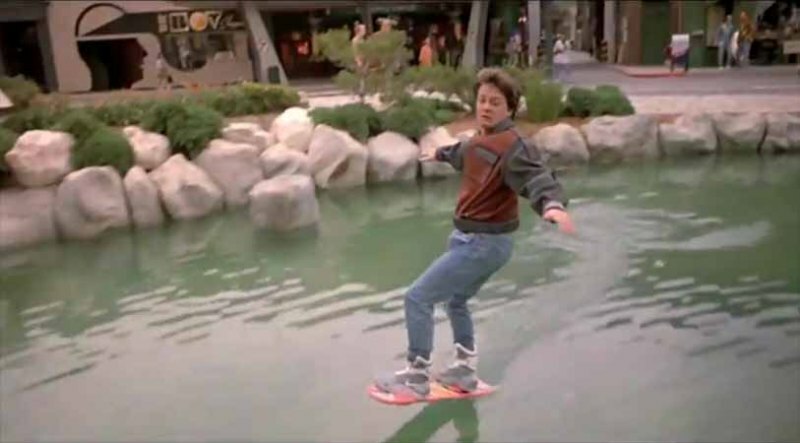 Yes, it’s true: as foretold in the prophetic Back to the Future 2, hoverboards exist! In the same year that Marty McFly travelled to the future and stoked the imagination of children everywhere, Lexus have unveiled a short video shows professional skateboarder Ross MacGouran riding a hoverboard around a facility in Barcelona. SLIDE floats around 2 inches above the ground and looks considerably cooler than the Mattel model Marty McFly rides. And, unlike the Back to The Future version, you can ride it over water! Unfortunately, there are a couple of downsides. The first is that it looks really, really hard to ride. Even though MacGouran manages to jump over a Lexus on the board, we see him and his mates bail quite a few times while trying to get his bearings. This is a man who gets paid to ride boards for a living, so there’s not much hope for the rest of us. Secondly, the board won’t work anywhere apart from the facility in the video. Lexus constructed a special magnet-embedded track which repels the superconducting materials at the bottom of the board, which enables the board to float. Basically, if you don’t have a track full of magnets, you can forget about riding a hoverboard. Finally, you have to fill the hoverboard with liquid nitrogen every 10-15 minutes. Most people don’t have access to liquid nitrogen, and certainly not in the quantities required to keep the board going.